Every day, obscene amounts of barbecue wings and mac and cheese make their way out of Whole Foods’ doors and onto the kitchen tables of GW students. But there’s an underground Whole Foods economy on campus, and the reality of this is that many of these late-night comfort foods are not paid for. 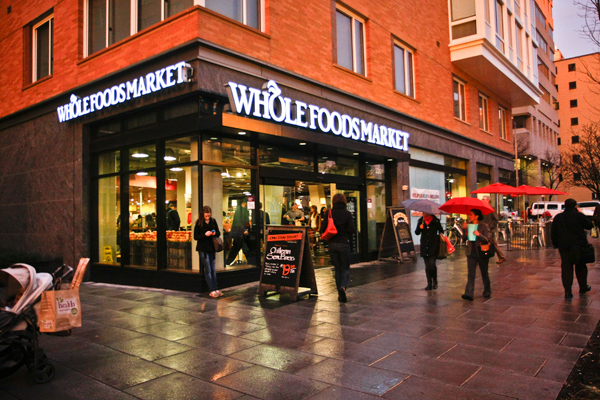 Like it or not, stealing from Whole Foods is a ubiquitous part of life at GW. It’s common and, as students well know, not entirely taboo. When the semester comes to an end – and students’ GWorld accounts are emptier than Gelman on a Saturday night – many rely on Whole Foods to survive the last few days before going home. Foggy Bottom might be the only place in the U.S. where one can say, “I don’t have any money, let’s go to Whole Foods” without any sense of irony. Some of the financial hardship is merely a fairy tale students keep up until their parents fly into town to take them to J. Crew. But other students experience real and insurmountable losses that not everyone on campus fully appreciates. The average debt at graduation for a GW undergraduate student is an burdensome $33,398, according to the Project on Student Debt, reflecting the financial lengths students take to come here. GW’s tuition alone is much more than my family makes in a year, and I know I’m not alone. While the Washington Post wrote a story last year about the obscene wealth of many GW students, it ignored the more drastic problem: There are actually students here scraping to get by. Our food plan doesn’t help the issue, and we shouldn’t forget that GW’s dining plan perpetuates its affordability problems. The topic has come up during the Student Association election season, with SA presidential candidate Daniel Egel-Weiss advocating for lower vendor fees at Tuesday night’s debate. Whether or not Egel-Weiss wins or loses, student leaders can’t let this issue die. Because of a 10 percent swipe fee that vendors pay GW, almost all eateries jack up prices in the area. By forcing all students, even those of limited means, into that system, eating habits become a financial burden. Going out to eat at restaurants like Sweetgreen and Thai Place might be convenient on GWorld – and since Whole Foods is right around the corner, it’s always so tempting – but this isn’t a cure-all. Making food is a seemingly more affordable option, but few students have the time to do so on a frequent basis. Even when students have time to cook, the options for groceries on GWorld are scarcely more affordable than prepared food options. Whole Foods is not just the source of copious amounts of strangely delicious oatmeal cookies. It’s also the only easily accessible GWorld full-service grocery store in Foggy Bottom. It’s overpriced, organic, free-trade, “cruelty-free” kale and almond milk are not exactly welcoming to GW’s more working class students. Safeway is technically another option for those of us willing to invest the mental and emotional strength and drag ourselves all the way to the Mount Vernon Campus, just to have to hike down a hill just to save a few bucks on groceries. And that’s not even an option for former Vernies who may not exactly be welcome on the Vex anymore after a few too many drunken nights. Simply existing at GW is a financial struggle. The fact that our food plan leaves so many without food stability, and willing to steal, reflects on the continued failure of the University to be accessible to low-income students. Getting quality food easily and regularly on a college campus shouldn’t be a privilege for the campus elite. Jonah Lewis is a sophomore majoring in political science and sociology.